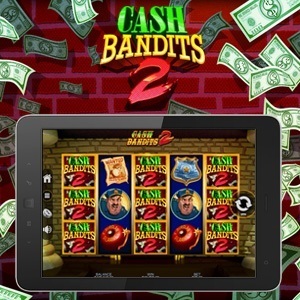 Are you ready to swim around in pile of dough with our new online slot game, Cash Bandits 2, from RealTime Gaming?! 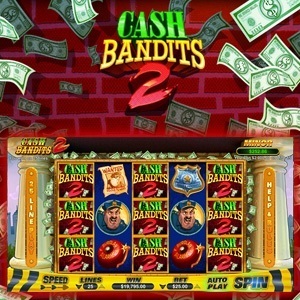 This 5 reel, 25 variable payline, progressive jackpot online slot game is teeming with all of the attractive features RTG is known to bring to their games, and with the theme of cash bandits at the forefront, it is sure to induce an adrenaline rush as you get on a spinning spree! With a minor Jackpot sitting at $250 and a major Jackpot at $1000, there is plenty of money to be won. But, that’s not all to keep a lookout for, as the Wild bounces around and is bound to make appearances, grouping itself on all reels and taking place of all other symbols to earn you criminally huge victories. There is an exception symbol, though it is not what you may have in mind. If a scatter Robber symbol shows face, then you have just unlocked the Vault feature! Truly awesome, this feature triggers 5 vaults and a keypad to appear, each requiring a random 1-5 digit code to open, thus awarding an initial 5 free games with a 2x prize multiplier. 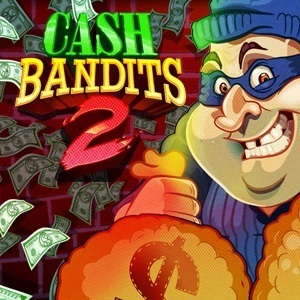 Completing the digit combinations will crack this feature and give out amazing rewards which border on the side of unbelievable, as you’ll be given the chance to unlock prizes ranging up to a staggering 190 Free Games, carrying a payout at 17x! Now ain’t that a heist! 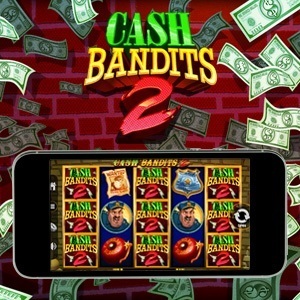 This online slot is available on Download, Instant Play and Mobile, so get ready to play Cash Bandits 2 today! © Copyright Jackpot Capital Casino 2019.